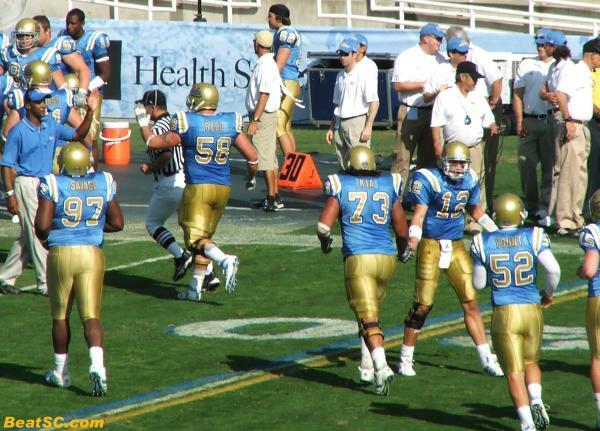 Al Davis and Lane Kiffin must be having recurring nightmares about UCLA Defensive Backs. 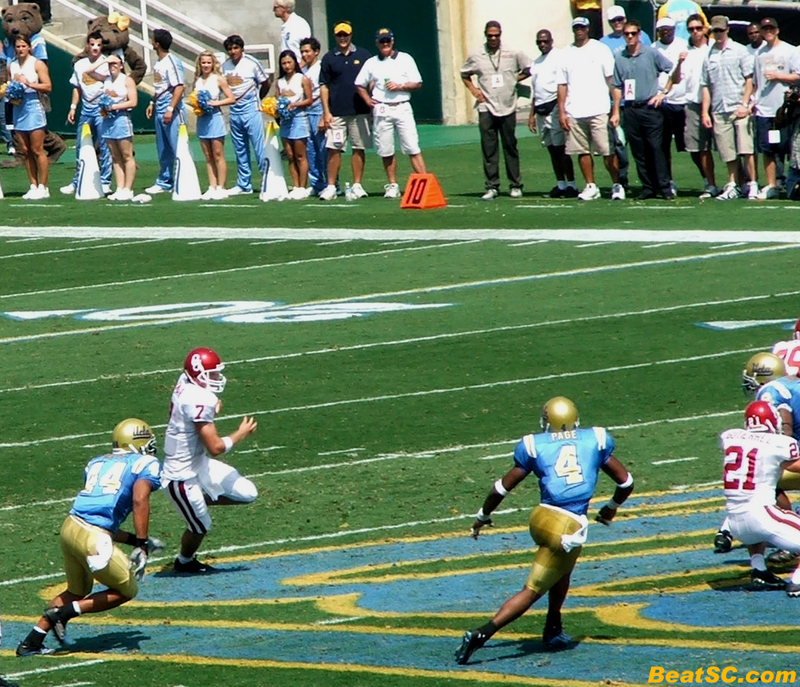 The Owner of the Oakland Raiders and his new Head Coach are both former trojan football coaches, so they are still smarting from Eric McNeal’s spectacular effort that basically TOOK DOWN the mythical trojan empire. And as if there was any chance that they could wipe that memory from their minds, it was cemented back in when Jarrad Page repeated History, in more ways than one. With the Raiders driving for a game-winning Field Goal against the Chiefs, Page picked off a Duante Culpepper pass, to give Kansas City a 12-10 victory. That’s 22 total points, just like in the 13-9 game, where John David Booty disappointed trojan fans by throwing a last-minute INT to McNeal. Increasing the double-Bruin-Whammy for Davis is the fact that Page did this exact same thing to the Raiders, and Davis’ previous hired gun Aaron Brooks, LAST year. And this year, Page added 4 solo tackles, including a huge play to stop Oakland when Kiffin gambled on a 4th and 1. Davis keeps trying to upgrade the Raiders from their recent Commitment to Excrement, but he does so usually by hiring trojans who weren’t able to catch on with anyone else. He already gave up on another former trojan Coach Norv Turner, and is still waiting for Kiffin and ex-trojan retread Mike Williams to make him NOT regret being so trojan-fixated. His other ex-trojan, RB Justin Fargas, is now a one-hit wonder, following his breakout game with nothing. The win, the Chiefs’ 9th in a row over their hated RIVAL, puts KC in sole possession of First Place in the AFC West, with a 4-3 Record, while leaving Kiffin’s woeful Raiders in sole possession of Last Place in the same Division, at 2-4. Is it time for Davis to turn the PAGE on the Kiffin Era? 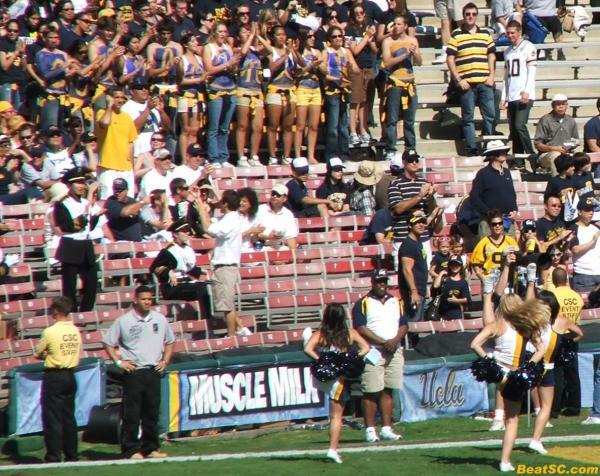 And now, let’s turn the page to the Raiders of My Lost Heart (after two Football Action Photos): The second set of UCLA Spirit Photos from the Cal Triumph. You might even think it’s better than the first set. 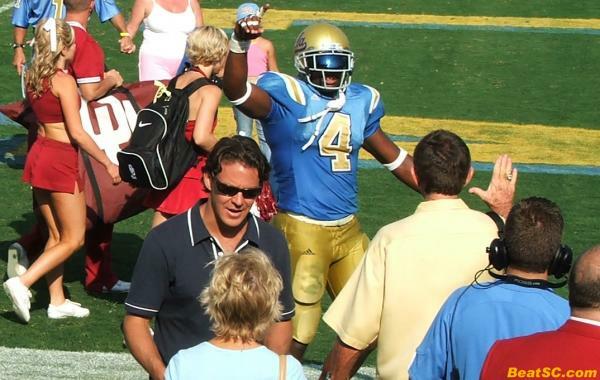 "SELF-COPYING PAGE JAMS UP TROY CANNON, AGAIN" was published on October 22nd, 2007 and is listed in Blue & Gold News, News from the Dark Side, Non-Rivalry News, UCLA/usc/Cheerleader Photos, UCLA/usc/Sports Photos. Awesome UCLA – Cal game LOVED every exciting minute of it, now if we could just repeat this win when we face our nemesis we’re golden!